With these darker nights and shorter days we’ve been taking it slow, spending more time playing inside the house. A favorite game is the tale of a little girl who visited her sick Grandma only to find she had been eaten by a greedy wolf (played always by the ferocious Arthur). 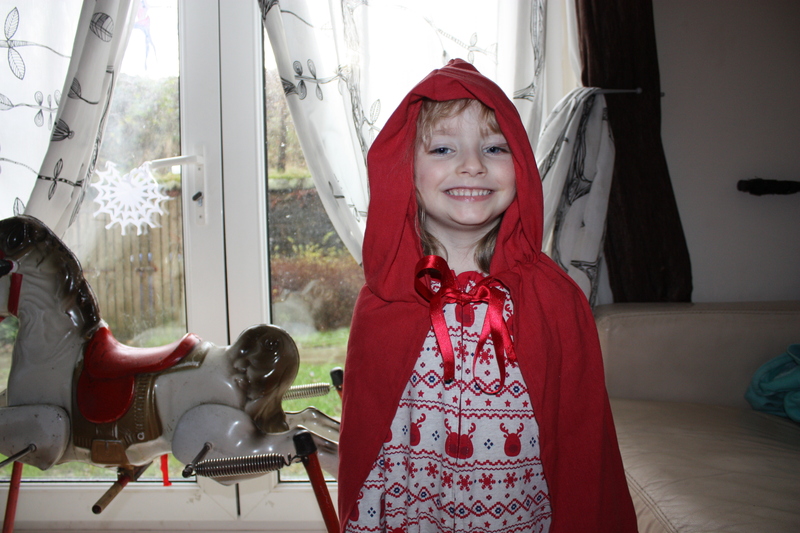 I want to give this red cape to Beth for Solstice but I couldn’t resist putting it on her for a few photographs. It was so quick and easy to sew. Generally I find I’m too inpatient to put much concentration into sewing but this took 30 mins. Simply, I sewed an inch seam around the length, then I folded the two corners together and sewed the top to create a hood. To add the tie I folded the material 1/3 down and sewed a seam. 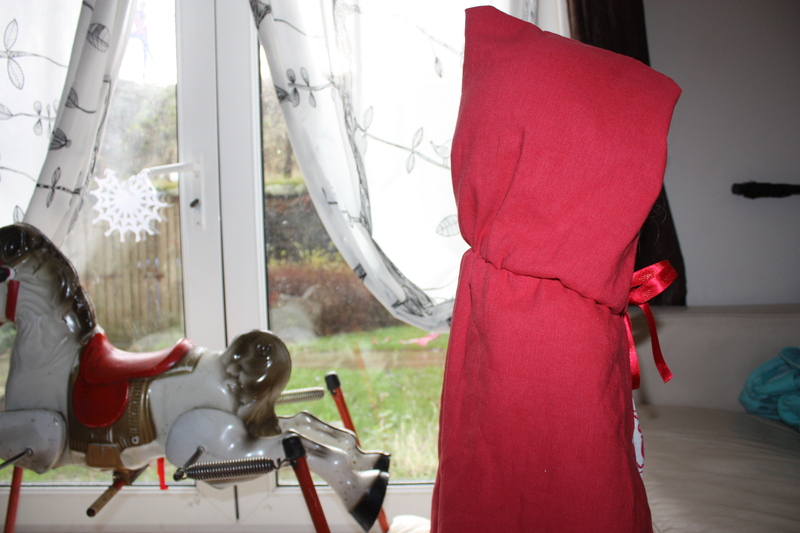 The I threaded a red glittery ribbon left over from the tag rag rug I’ve made Arthur for Solstice. 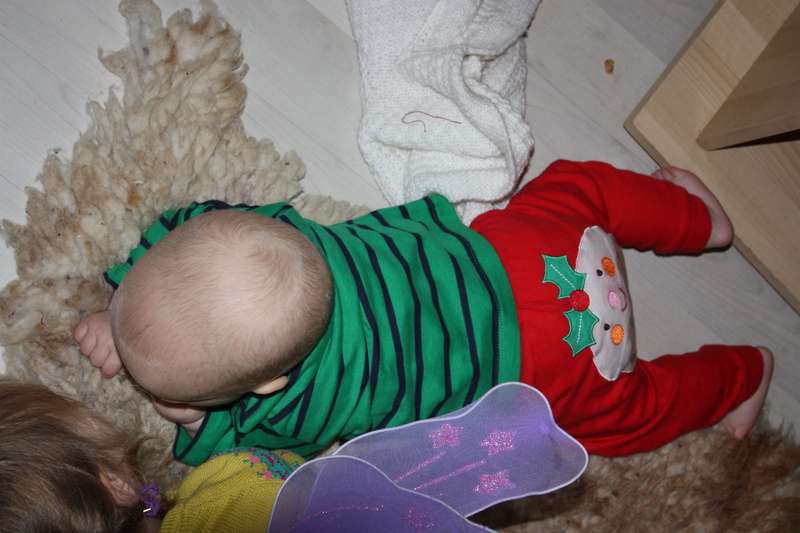 Also, our big bad wolf has started crawling. I tried to take a better photo but Beth kept ridding on his back! I’m a bit worried about his teeth. His incisors are cutting threw but his front two teeth are not showing any sign of coming soon. He keeps falling over and off things so hopefully he hasn’t damaged to two front teeth! As I type he has four huge red marks on his head. I’m glad he has lots of great hats to hide it from concerned members of the public! My Mum says maybe he is just waiting for Santa to give him his two front teeth for Christmas, Oh ho ho! I have a really busy weekend ahead starting with friends coming for dinner tonight but I have nothing to feed them. Is beans on toast acceptable?